Have you ever tried making anything out of sauerkraut? If you haven’t, I won’t be surprised, as it’s not what British people typically eat – I’ve never seen it on restaurant menus, mentioned on social media or on food blogs that I follow (apart from the Polish ones). But sauerkraut is widely used in Slovenia and you will either eat it in a side dish or in a sauerkraut stew, called ‘jota’. 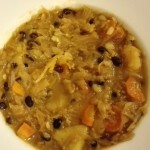 ‘Jota’ or sauerkraut stew/soup is one of my favourite things to eat in winter but I rarely make it in the UK. I always felt it’s a typical Slovenian dish, meant to be made in Slovenia, using Slovenian ingredients. Making it in the UK just didn’t feel right to me although I did try making it once ages ago but sauerkraut just wasn’t right and at the end, it didn’t turn out quite as expected. 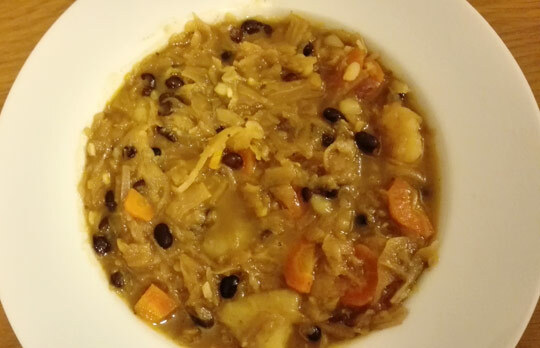 Traditional ‘jota’ is made with sauerkraut, brown beans, potatoes and some pork meat like smoked pork ribs which would cook together with sauerkraut. It’s also very common to eat ‘jota’ with sausages. Meat gives it a nice flavour but also fills you up and without it, they say, it’s actually not real ‘jota’. Anyhow, I decided to make my own vegetarian version of it, just to see whether I could still make it taste good, but with no meat. I thought really hard about how to make my ‘jota’ tasty without meat and at the end I decided to use paprika, smoked paprika, bay leaves and marjoram to enhance the flavour. My ‘jota’ is also different from the typical Slovenian one in that way it contains chopped carrot. This is how my mum always made it and I liked it that way so I would never skip carrots when making it. In Slovenia, when they make ‘jota’, they make it from scratch and this includes cooking beans from scratch – soaking them overnight and then cooking them the next day. I decided to take a shortcut and buy organic black beans in a carton from Sainsbury’s. I wouldn’t want to use typical brown beans they use in Slovenia anyway as I never really liked them too much, and well, also you cannot find them in England. You can buy sauerkraut in any Polish shop and some supermarkets, just make sure the ingredients are only sauerkraut and salt, it doesn’t need anything else added. Also, make sure you use organic potatoes to ensure no pesticide residue. You can buy them in Aldi for pretty cheap. You could keep the skin on for extra fibre and nutrients, just make sure you wash them well. I decided to peel mine, as per traditional Slovenian recipe. Where I come from, we used to make ‘jota’ with barley in it which I loved (longer cooking time though!) but some people say that if you put barley in it, it’s not ‘jota’ anymore. After doing a bit of research about it, this is actually true. But just to give you an idea of what you could do put in it really. 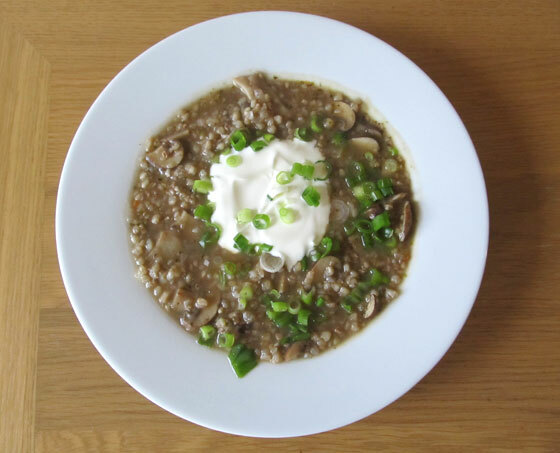 If you make it with barley, you should soak it overnight so it cooks faster the next day. You would then cook everything in one pot and not separate as in this recipe. Adding barley would make it more filling, especially in a vegetarian version. Place the sauerkraut in a sieve and rinse with cold water. This is to wash some of the sourness away so that it's not too overpowering in the stew. 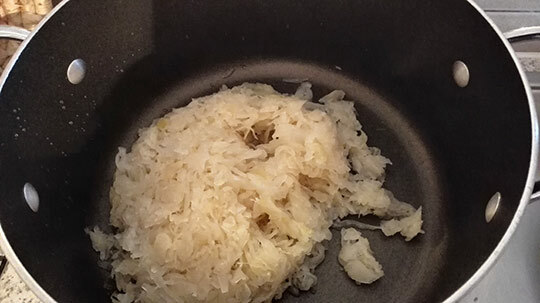 Put the rinsed sauerkraut in a big saucepan. Add enough water to cover the sauerkraut well. Twice the water should be more than enough. Cook the sauerkraut with 2-3 roughly chopped cloves of garlic, the cooking time is around 30 minutes or until the sauerkraut is soft. Also add paprika, smoked paprika, bay leaves, marjoram and vegetable stock cube, giving all these ingredients enough time to release flavours into the stew. While sauerkraut is cooking peel the potatoes and chop them into equal pieces. Clean the carrot and slice it. Put it in a saucepan with potatoes, cover with water and boil for around 10 minutes or until potatoes are soft (this will depend on the size of the pieces you cut). Once cooked, drain and set aside. Slice the onion and gently fry it in enough rapeseed oil, until soft. Add chopped garlic (2-3 cloves) and make sure there is enough oil left for it to gently fry it until it releases the flavour and softens a bit. This should be very quick. Add more oil if needed. 5 minutes before the sauerkraut is cooked add the cooked potatoes, half of them mashed with the fork - this will help to thicken the stew. Next, add the drained black beans. You could use their liquid if the stew feels too thick. Finally, just a few minutes before the stew is ready, add the fried onion and garlic. Leave it to stand in a saucepan for at least 30 minutes. It will taste better thereafter. You could add the whole carton of black beans if you like. I didn't want to add too much that's why I decided not to put the whole carton, however the whole carton should be fine. This stew will result in 2 good adult portions but it could serve 3 people as well, just make sure it's not the only thing which is being served as on it's own may not be that filling. If it feels too thick just add some water, however it should be the consistency you see in the pictures (pretty thick). At the end I was really happy with the way my ‘jota’ turned out. It tasted amazing! You would have never guessed there was no meat cooked in it for flavour. I think it actually tasted better than any ‘jota’ I had previously made and what’s more, it’s totally vegan! What do you think of the recipe? Will you be giving it a try? Do you have any sauerkraut recipes you could share with me? This sounds like something I need to try! I’m actually planning on making my own saurkraut for the first time this week. Got the canbbage and jars ready! It’s amazing in healing the gut bacteria! Wow, you are going to make your own sauerkraut? That’s really good. I think I read somewhere that it’s not that complicated actually, would love to hear how it turned out at the end. Yes, raw sauerkraut is really good for your gut but unfortunately when you cook it it destroys the good bacteria. I have never even tried sauerkraut before, and I am not sure why, as I love cabbage. You have inspired me to try it. If you go to any of the German markets this year you can try cooked sauerkraut there. It’s quite tasty. Glad to hear that! I hope it turns out ok for you. Thanks Vicki! It’s a really tasty stew although the pictures don’t really show it. This sounds delicious! I adore sauerkraut and eat a lot of it since it is so good for you. I’m a vegetarian, so would love to try your stew. It’s my favourite thing to eat in winter! 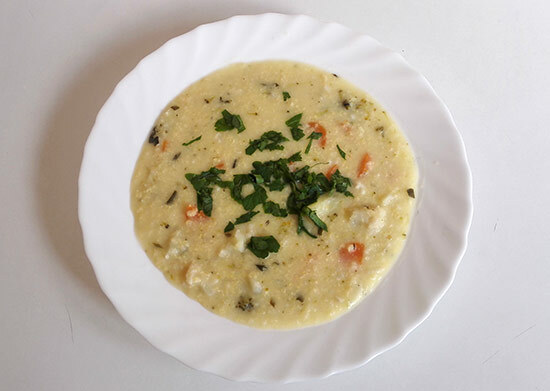 You should definitely try making it, it’s delicious and healthy. Yes, you can find sauerkraut in Polish shops. This is where I normally buy it. I know exactly what you mean by sausages. ‘Jota’ shouldn’t actually be called ‘jota’ without some kind of meat in it, normally they eat it with sausages in Slovenia, but still, you can make a vegetarian version. The key is to add enough smoked paprika as this creates a really nice smoky flavour and like this you won’t miss meat, I promise!